Our photography guide to Santorini will show you the best spots on the island to take breathtaking photographs. 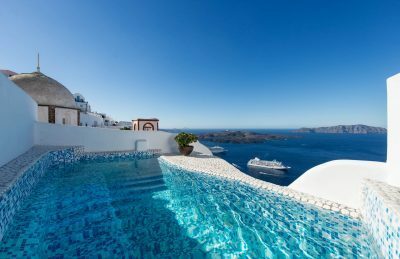 Planning on your dream trip to Santorini? You want to make sure to bring home stunning photographs. This Greek Isle is what dreams are made of. We had visions of taking a quiet retreat to Santorini, and the island didn't disappoint. Some people maybe have a couple of days if they're lucky to visit Santorini. Most people will only have a quick stop on a Mediterranean Cruise so you need to make the most of finding the best places to photograph the island. We searched high and low for many of these shots and have given tips and directions on where to find them. 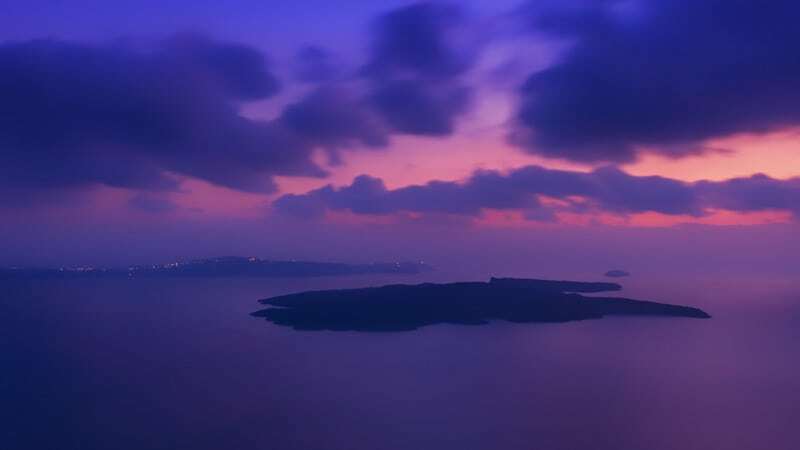 Here are the best photos we feel that capture the island of Santorini and how you can find them. It's the iconic postcard shot of the island. If you only have a limited time you may not be able to find the spot to take a photo of the famous blue domes. As you walk along the main marble streets of Oia back from the castle, look for a ritzy looking jewellery store on the main street. Walk down the alley towards the water and you'll see the domes as you look out over the caldera. There will most likely be crowds there. They start to leave as sunset approaches. Every night at sunset crowds form at Oia Castle to watch the sun go down. It's a bit of a zoo and not the romantic experience one would hope for. But if you wait a bit and go to the castle after you've taken your photos at the domes, you can capture this magnificent view of the town of Oia lit up at blue hour showcasing the windmill. Don't look out towards the sun, instead look back at the city. Andronis Luxury Suites are located in Oia and has one of the best views in Santorini. With beautiful rooms and a stunning infinity pool this is luxury at its finest. Iconic Santorini is a Cave Hotel located in Imerovigli. It has a great view of the Caldera it has the most comfortable beds we have ever slept on. Villa Renos is an affordable option. 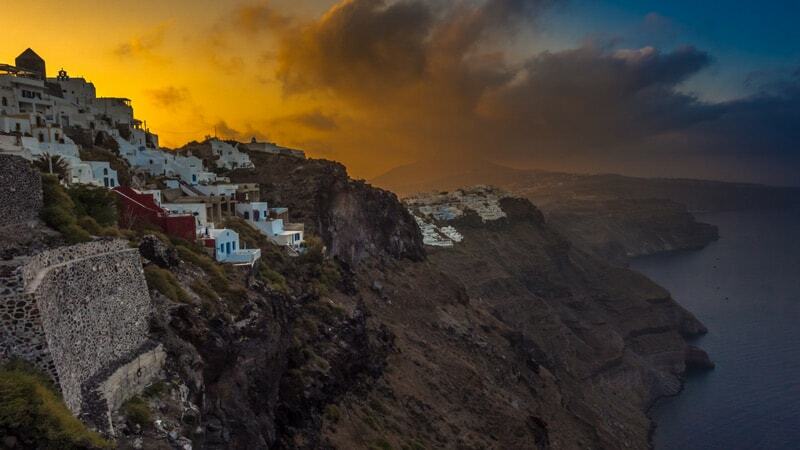 Located in Fira it has great views as well as a breakfast to die for. The rooms not as luxurious but the staff is the most friendly in Santorini. Just up the stairs from Mama Thira's house in the town of Fira, you will find this beautiful blue dome overlooking the Caldera. We searched all over for these three bells and it wasn't until our second last evening on the island that we finally found it. So make your way to Mama Thira and walk up to the top of the cliff. You'll come to a parking lot. Look over and there's the dome. Want to get paid to travel? Read our post now. If you walk a little farther East from the three domes, you'll find this rooftop in Oia. It makes for a great vantage point for sunset and you can capture the sun going down over the city. The cross adds nice foreground interest to the photo. 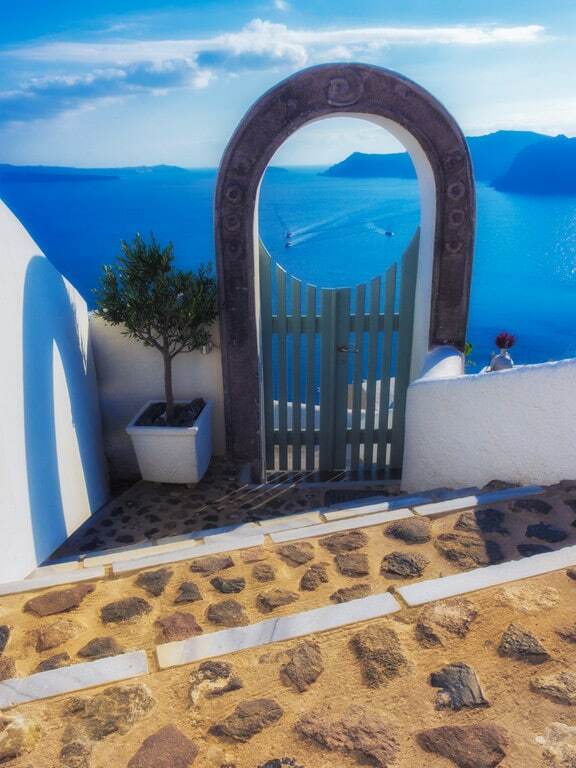 Between the towns of Oia and Fira is a beautiful town known as Imerovigli. We stayed here for two nights at the Iconic Santorini and it was heaven. 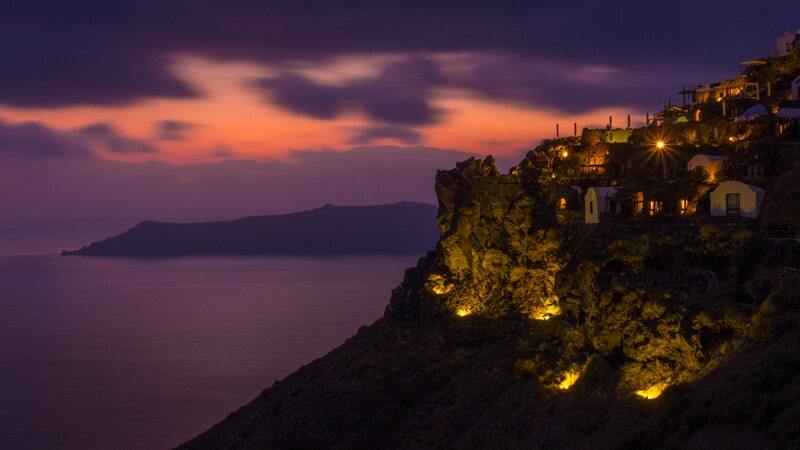 Forget sunsets at the castle, Imerovigli is the place to watch the sun go down over the Caldera. It is a half hour walk from Imerovigli to Fira or you can take the coastal walk for three hours to Oia. Or you can drive to either. Parking is cheap and often free. Everyone always talks about the sunsets in Santorini, but the sunrises are pretty special too. The place to capture a sunset is from the town of Imerovigli because as you look back you capture the high sea cliffs as well as the town and neighbouring city Firostefani. But to really take it in make sure to enjoy a Santorini sunset from a Catamaran. Each night we would watch historic tour boats that looked like old Junk Boats leave for a sunset cruise. We caught this shot by walking down a hotel's stairs in Oia as they came in from their afternoon tour just before heading out again for sunset. You have to capture a shot of these, they're a staple of the island.This is a popular spot to photograph the caldera and it is along the main path of town. 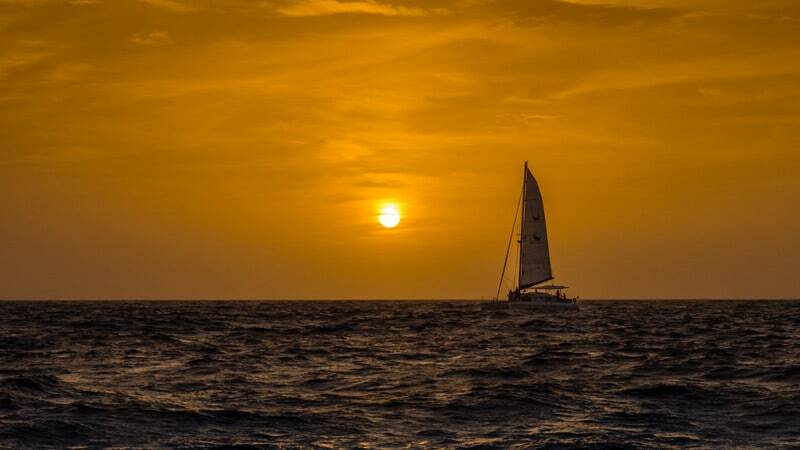 If you can, try to go on a sailing trip of your own. 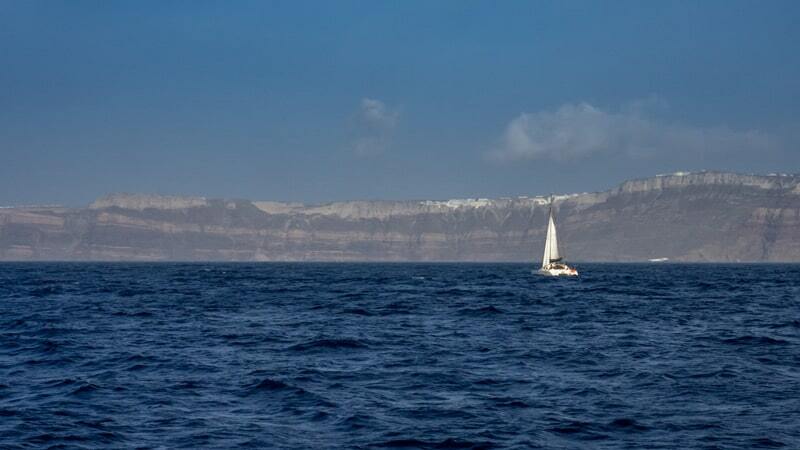 It's much more intimate than the large party boats and you have the opportunity to see Santorini from the sea. The cliffs are higher and more dramatic that you realize from below and the white cities can be seen like icing on a layer cake spread out over the high sea cliffs. Gear Guide: Make Your Travel Photos better with the proper photography gear at our Complete Travel Photography Gear Guide. 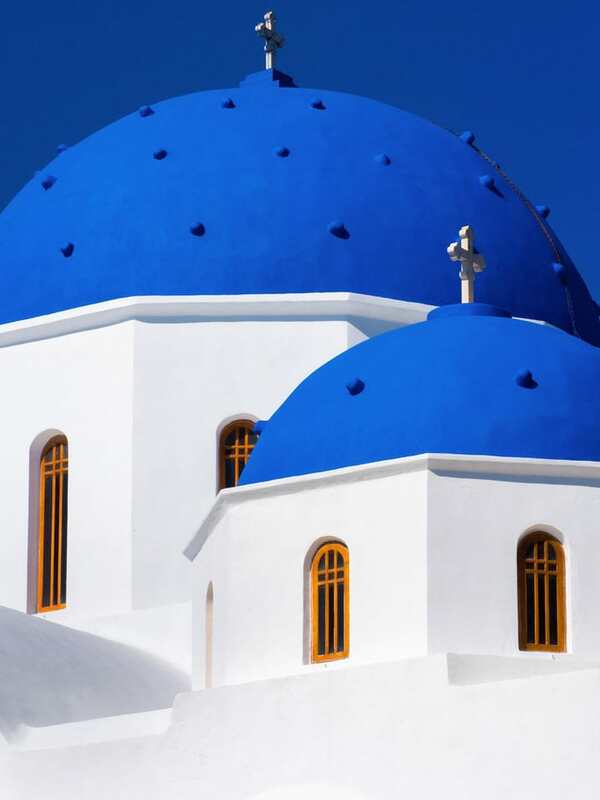 Oia, Fira and Imerovigli aren't the only place to capture photos of the blue domed churches of the island. This one was taken in Perissa which is known more for its Black Beach. We drove to the South Side of the Island often to explore the quieter nooks. Perissa isn't exactly a quiet spot as it's the premiere beach on the island, but in October, it's winding down for the season. Beach bars and cafés line the sand filled with beach chairs, but when we turned around we saw this blue dome. I think it is just as impressive as the others on the island, don't you? That's not to say we didn't enjoy the Black Beach. You should definitely spend a day here. The water is warm and secluded, the sand is hot, there are a lot of options for food and drink and a chair rental costs €5 a day. Regular busses take tourists from Fira to Black Beach all day long. When visiting Santorini, you must make sure you rent a car. They're cheap and it makes life so much easier to get around. We drove all over the place and had the freedom to come and go as we please. When driving along the coast on the west side of the island from Fira, follow the signs to Akrotiri. Take that left turn but drive past Akrotiri. You'll come to a parking lot at a church. From here you walk along a rocky path to the beautiful red beach. It used to be a quiet haven, but now it's quite busy. However, it's worth the stop for a striking photograph. Get there early for the best photos. You won't get photos like this from land. You need to be out on the water at sunset. When all the boats start coming in, have your camera ready to snap shots. You'll find that you'll be side by side with many sailboats and you'll easily be able to capture that classic shot. A trip to Santorini isn't complete without a trip out to sea. Don't be afraid to explore a little. The hotels may be private, but if they don't have a gate across them, it doesn't mean you can't venture down for a view. Now to enter the pool areas or private balconies without asking is a big no no, but to walk down their steep steps for a closer view doesn't hurt. We enjoyed just strolling to unknown places taking us to dead ends in paradise. Let's face it, Santorini is a cruise ship mecca. 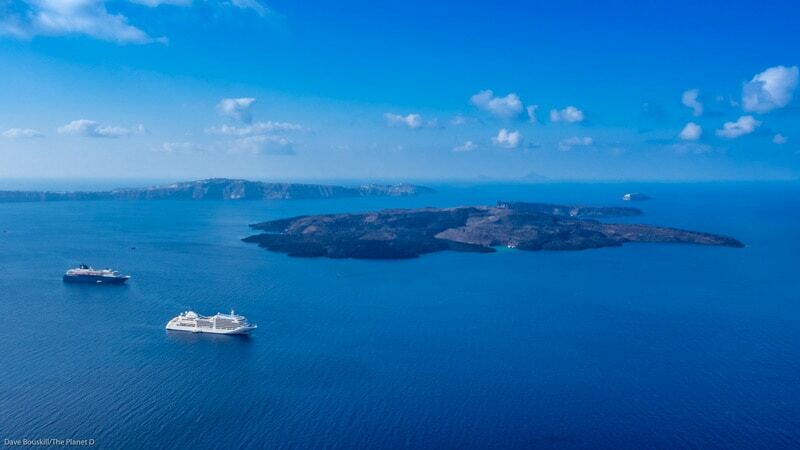 We heard that during the summer months, up to 8 cruise ships can be anchored in the Caldera. We found two to be quite enough for our liking and to watch them leave the island was like a breath of fresh air. When the ships are in, it's over run with people. It's crowded, stifling and difficult to look at anything. But once they leave, it's paradise and that is why you should stay on Santorini as opposed to cruising. But, it is one beautiful view isn't it? 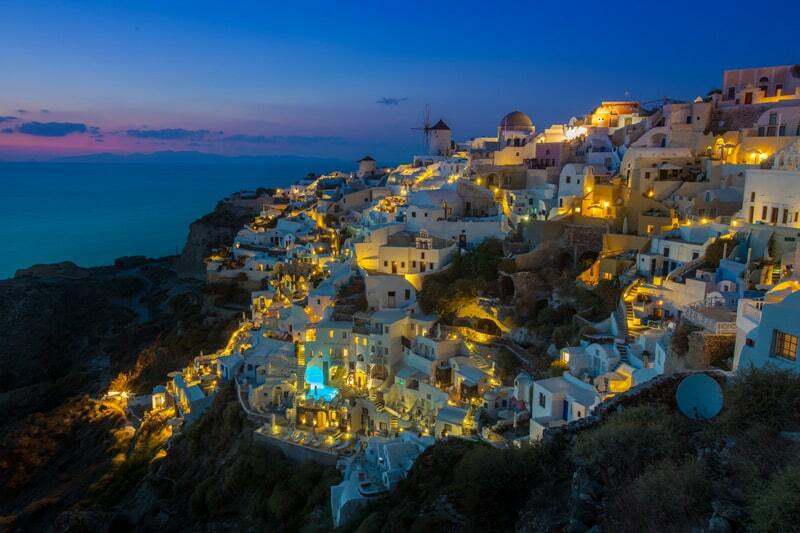 We are able to see places like Santorini because it's our job. Read How to Start a Travel Blog in 10 Easy Steps. At sunset walk along the pathways of Imerovigli towards Oia. When you pass yet another church with a blue dome on an outcropping, you'll see that the city continues and this makes for a beautiful view showing of the pastel colours of the buildings. Most hotels are painted white and blue in Santorini, but here, they have adopted the pastels and at sunset it's gorgeous. 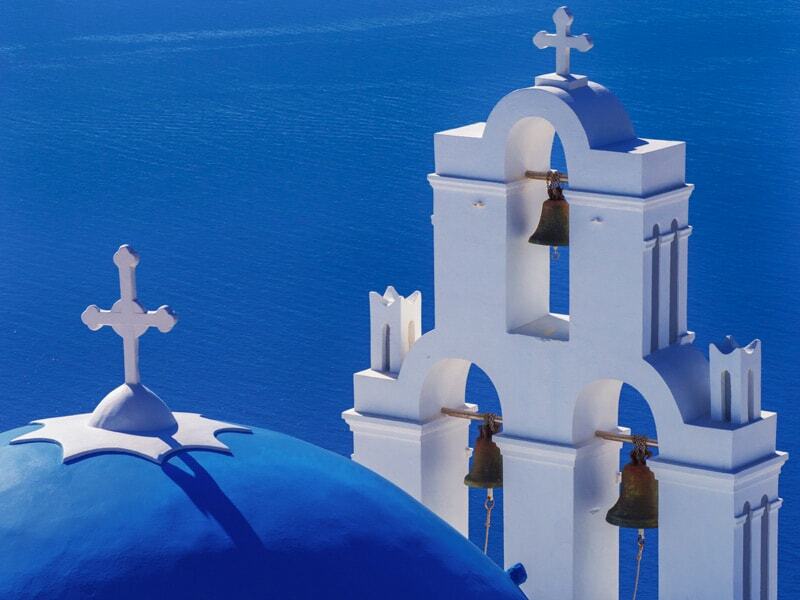 Santorini is one of the Most Romantic Destinations on earth, see more of our list. By having a rental car on hand, we had the opportunity to explore other cities rather than the very beaten path. We found Pygros to be a charming ancient town and we had the streets to ourselves. Located high on a hill, you can see a lot of the island from Pygros. Yes, there are blue domes to be photographed. But it was the back streets that caught our attention. They haven't been painted or completely renovated like the other towns, this town feels like it is old and hasn't changed...yet. Catamaran Sunset Cruise - We loved this tour with complimentary barbecue, wine and drinks. 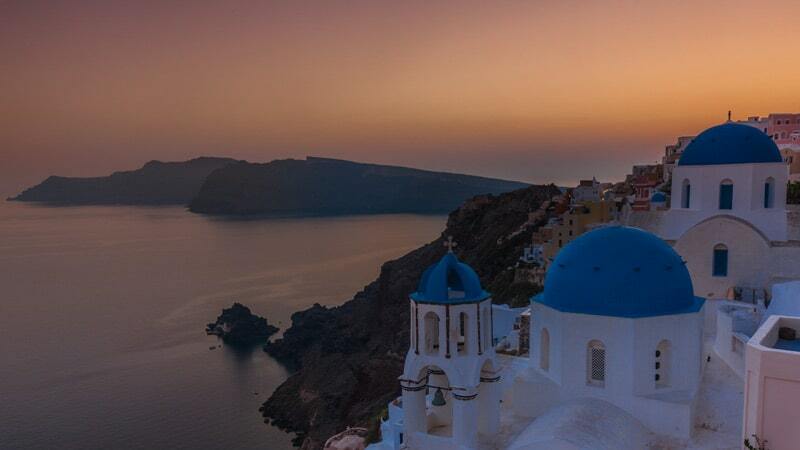 But the views of Santorini are what is most memorable. The sea cliffs, red beach, black beach and snorkelling. Sunset and Wine Tour -Visit 3 traditional wineries and taste at least 12 wines before relaxing at your spectacular sunset view. 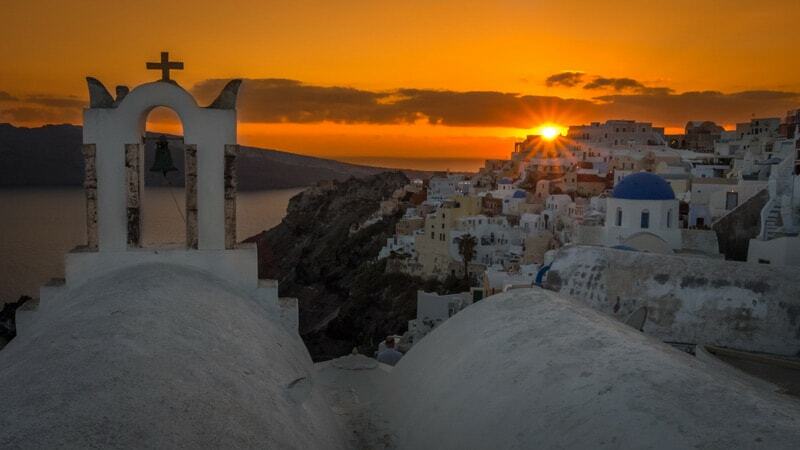 Nothing beats sunset in Santorini. Best of Santorini Private Tour - If you want to see it all and have little time, a private tour is the way to go. A Mercedes minibus takes you to all the tops spots including Santorini Caldera views, Oia, Imerovigli, Firostefani, Mt Prophet Ilias, Pyrgos, Megalochori, Akrotiri, Red Beach, Black Beach and Venetsanos Winery. E-bike Tour - We love riding bicycles and an electric bike is even better. Explore the island on this unique tour while exerting minimal effort. This tour starts in the traditional village of Emporio and goes through other villages where you'll enjoy local food and wine. Introduction to Sea Kayaking - It's no secret that Dave and I love sea kayaking, if you want to try it Santorini is the place. You'll start in a secluded area and explore the south of the island where you'll also be treated to a picnic lunch. 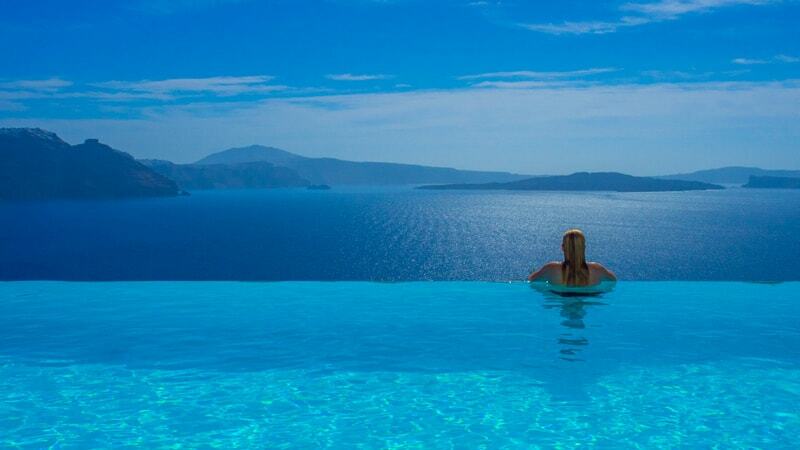 When walking through the streets of Oia, you'll see infinity pools dot the cliffside from luxury suites. It's worth splurging for an evening or two to stay at one of these suites. They are truly a slice of heaven. We stayed at the incredible Andronis Luxury Suites and their views were second to none. It was an outstanding hotel right in the heart of Oia, but it had a quiet and peaceful feeling that you were away from all the hustle and bustle. We've had a lot of people in social media ask us about this pool. To check out rates for the Andronis Luxury Suites here. 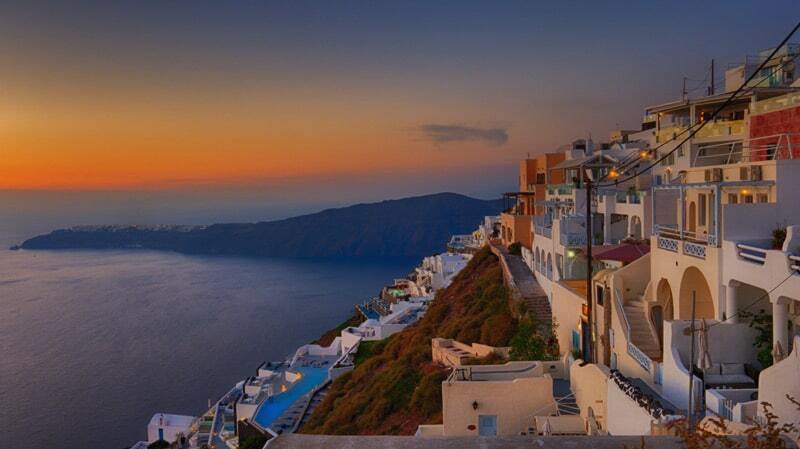 If you really have your heart set on a sunset over the caldera, (which you should) take that shot from Imervogili. There are no crowds and it is just as beautiful if not more than from the church. To us, crowds take away from the experience. Sunsets should be enjoyed in silence and this was a quiet private sunset with just the two of us sitting on a rooftop. Have you been to Santorini? Did you find all the photography locations that you wanted to see? 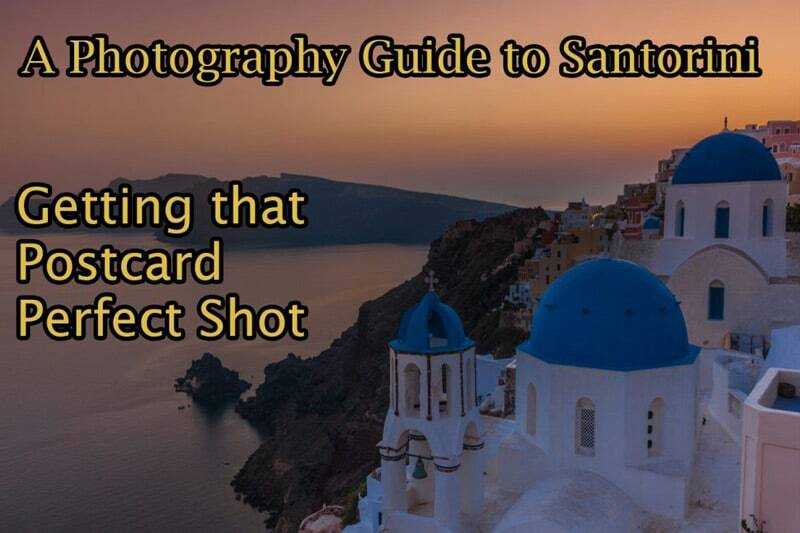 33 Responses to "A Photography Guide to Santorini – Getting that Postcard Shot"
We love the greek islands and we are really looking forward to visiting Santorini for the first time. Rock on theplanetD will be looking at other travel destination’s you’ve visited whilst sipping a cocktail or 2 watching the sun slowly disappear over the horizon. Wow! Cant take away my eyes from the pictures. Great job and guide to Santorini. Can’t wait for our upcoming trip in October last week. Thank you for your travel blog, very detail and clear. I am currently in Santorini. and try to look for good photo-spot. Your photos are wonderful. Since I am from Greece, I have been in Santorini island before, and I have to say this is an excellent, spot-on guide! Amazing and inspiring pictures!! Especially those taken from Imerovigli and the one taken from Oia Castle looking at the city! Good thinking to not just watch the sunset as everyone else does! Amazing photos! You guys rock! Lovely photos! Thank you for sharing, its a very helpful post ? Hi guys. I totally enjoyed your article. I am a Greek and I have been to Santorini twice. I am glad you had transferred the spirit of the island through your post. Let me know when you come back again. Hey Dave, the shots are awesome. Do you mind to share the exact spot that you have selected to take all those pictures? Hi Chris! I am so happy that you feel we captured the spirit of Santorini. That means a lot to us coming from someone that lives in Greece! Really enjoyed the Santorini photos. The best time of year to be there is July and September. I am a Greek and have been there 2 times. Very special place for around the world weddings taking place. After returning from my first trip to Santorini, I discovered my old film camera hadn’t exposed a single frame of film. Needless to say, I threw a fit, and made a vow to return to Santorini if only to reshoot the images. I did just that about 6 years later, and still can’t get enough of that certain, special light you only find in the Greek isles. Stunning images, and your timing with the cross and Oia photo is impeccable. Ha, honestly, I spent most of the time on Santorini (and loved every minute of it) half blinded by the light (it’s just so bright, and that’s reinforced by all the buildings). I fluked a few good shots but also got a lot of washed out ones! Beautiful pictures. My wife and I, along with good friends, visited Santorini this past October and as you stated, were only able to spend the day there from our cruise. It was, however, my favorite island by far. 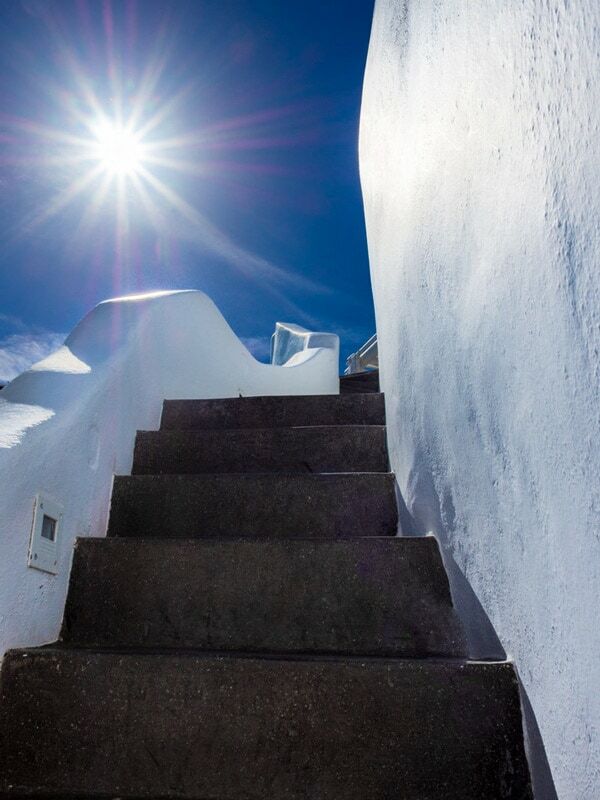 Fantastic photos — you have enough here for a Santorini calendar. And you caught two of my bucket list items: to see the Greek islands and to spend a whole week. photographing a place to find those few golden shots. You da Man Dave!!!! Gorgeous photos!!! What beautiful photos! Greece, especially the islands is at the top of my list as my family on my Mum’s side is greek so I grew up loving greek food and culture. Planning on spending a whole month in Greece, including a week on Santorini next July. Can’t wait. Wow, amazing photos! 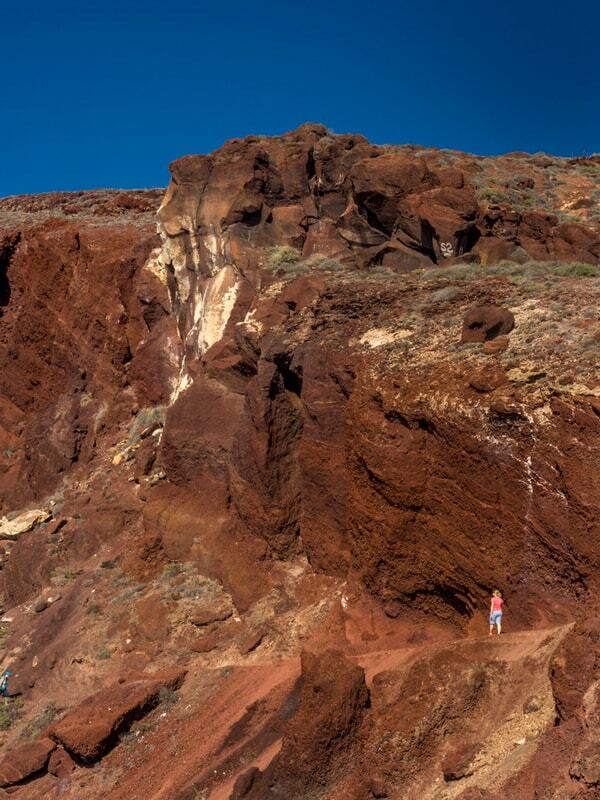 Did you get to walk on Nea Kameni (the volcano)? Def. worth the trip. Santorini rocks! Have been a couple times before, and can’t wait to take the kids now. Thanks for that inspirational push! Great photos. Haven’t been but it makes me want to now. thanks! Glad we could entice you to explore more of Santorini. Oh my gosh! I can’t help gushing…You guys rock! I love the photos with the two of you in them! Not that I like the others any less. But I love the way you have planned each and every shot! Thanks for this visual treat! Aw, thanks Renuka. We actually wanted to include more photos of the two of us, but then thought…well that doesn’t make a good postcard photo does it ? 😉 so we put in a couple in the end, but kept the rest to those iconic shots that people would be looking to take in Santorini. Thank you for the kind words. It really is one of the most beautiful places on earth isn’t it. I don’t gasp often when I see a place for the first time, but when I walked up from the parking lot to look at Imerovigli for the first time I actually gasped!